Despite the huge number of negative reviews. 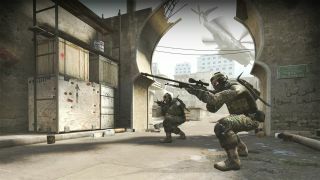 Counter-Strike: Global Offensive, having opened the floodgates by shedding its price and introducing a battle royale mode at the end of last year, has seen quite the bump in players. On Twitter, CS:GO sleuth Nors3 reports that 20,535,709 unique players duked it out in December, twice the number of players the game boasted in the previous month. Popping over to SteamCharts and SteamDB we can see the average and peak player numbers. On December 7, CS:GO shed its initial price and added the Danger Zone battle royale mode, causing a significant spike on the graphs. SteamCharts recorded an average player count of 395,509 during December with a peak of 746,548. November had 310,085 and 546,031. This does not, however, beat its record for concurrent players, which is over 850,000. Certainly, though, it’s a big increase over the rest of the year, where CS:GO frequently averaged less than 300,000 concurrent players. A lot of people might be playing CS:GO right now, but they certainly weren’t happy when Valve announced the changes. CS:GO received 14,000 negative Steam reviews in a single day after going free-to-play, and they kept rolling in. Many players were frustrated because they’d already invested money into the game, and the gift of a loyalty badge didn’t make them much happier. 7,000 positive reviews were also written, however, so there were plenty of optimistic players, too. It’s also worth noting that after the dust settled, around a week after going free-to-play, the new positive reviews started outweighing the new negative reviews again. In the short term, it seems to have worked out, but a single month isn’t much to go on. Did any of you lot take CS:GO for a spin because it went free-to-play? Let us know if you’re going to be sticking around in the comments.